Does he give a damn? That's what Christopher Shayne is trying to work out on the opening track to his debut album 'Turning Stones'. This former Whiskey Six man is posing one of the most fundamental questions in the style of latter day Lynyrd Skynyrd. Hell, if the words 'Gods and guns' were hollered mid-song, you'd swear this cut came from the same sessions! Bringing Dave Lansing with him from W6, what you have here is that updated Southern sound that's finding so much favour right now; 'Give A Damn' the first of many hard hitting Country-tinged slices of Rock this fire cracker contains. 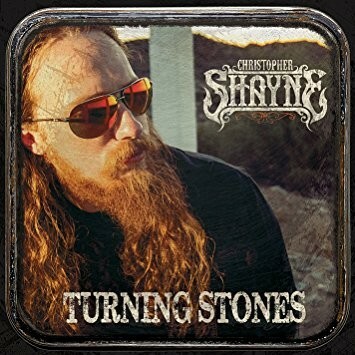 If you've never heard of him before, Shayne can certainly sing, power and range brought together with an authentic drawl that leaves you marveling that someone that sounds so good can sound so damn bad. 'Rock Show' swaggers into view on a groove big enough to fill an arena, and with 'Outcha Mind' adding an acoustic strum to the bold electric guitars, you could be forgiven for thinking that 'Turning ...' is more about throwing Rock shapes than tipping its Stetson. That is, until you point your steed at the Tyketto-does-Country of 'When I Come Home', the mid-paced stomp of 'The River Revival' or the heart-tugging 'Find Our Way', which all merge the two aspects of this album quite wonderfully. Surprisingly, the title track turns out to be a short guitar instrumental, which leads into the twang 'n' bang of 'Rolling Bones' where guitar and voice work alongside hand-percussion for one of the most Countrified moments. Although with its snarling, "American Dream" questioning lyric (disenchantment with the modern world a theme throughout), this is no tamed beast. With the likes of Blackberry Smoke rightly being lauded as one of the most exciting things to happen to Rock music in the last decade, it's no surprise that we're starting to see the coat tail jumpers coming to the fore. Christopher Shayne is so much better than that; this is music from the heart and for the soul. If the latter day Skynyrd sound hit you hard, you'll love 'Turning Stones'.